Forget have to ask random passersby to take a picture of you. 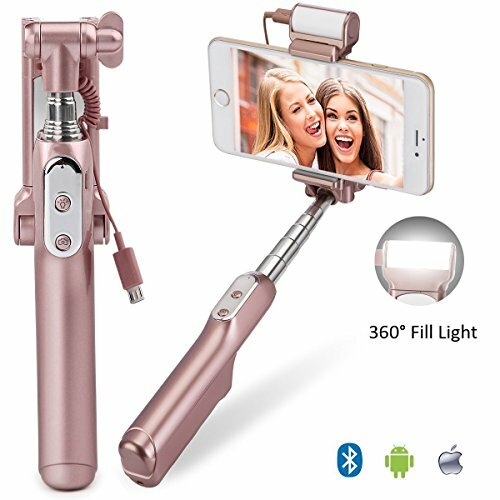 Just do it yourselfwith 360° fill led light, show off your best smile, and simply press the selfie stick's shutter button. Unleash the professional photographer in you and enjoy taking the most original shots anytime and anywhere. The Selfie Stick pairs over Bluetooth for an easy-than-ever experience that has no trailing cables of any sort, whether your smartphone runs on iOS or Android. Thanks to a phone holder, the selfie stick is compatible with most devices - from the smaller iPhone 4 to the latest iPhone 6s Plus. [ Update Version ] Adjustable 360° fill Light rotation provides you more natural light and makes your photos more beautiful and excellent for night photos shooting. [ Small and light ] 183g weight, 18.5cm/7.3in (shortest)--88cm/34.6 (longest), Extendable and Foldable handheld monopod design,you can even put it in your pocket,easy to carry. [ Front& Rear Camera ] With a knock-down mirror and can be taken photo by rear camera let you show your best beauty all the day and night. 1500 mAh high capacity. [ Compatity ] The clamp of the selfie stick can extend to 8.2cm, fits for 6 inches or less cellphone.Compatible With All Smartphones for iPhone 7/7 plus 6s/6s Plus/6/6 Plus/5/5s/5c/4/4s, ios 5.0 and above; Samsung Galaxy S7/S7 Edge/S6/S5/S4/S3/S2/Note 3/Note 2, LG, HTC, Android 4.2 and above. [ Warranty ] Every MOCREO product comes with a 12-month worry-free guarantee. If you have any problem or suggestion, please feel free to contact us, we will do our best to make thing right for you. If you have any questions about this product by MOCREO, contact us by completing and submitting the form below. If you are looking for a specif part number, please include it with your message.